The revolution of the online world has influenced many things during the last decade. The way we communicate and learn differs greatly than what used to be the norm a couple of years ago. Students as well as teachers now have access to all sorts of technological devices like smart phones and tablets that introduce new teaching and learning methods but also demand new types of skills. Blogging is a great tool to develop these skills. Some people believe blogs are boring or 100% technical but over the years I've learned their importance. They help to combine technology, creativity, argumentation, and writing skills. It is an interesting mixture of skills; not too many hobbies or activities involve such a wide range of know-how at the same time. So, what would students learn if they had a blog? It is often said that technology is the literacy of the 21st century. There is a lot going on in the world of technology and everyone needs to have a basic understanding about using computers. It is a bit like math, which teaches us how to think and understand the world from a different point of view. Blogs are a great way to expose students to technology even if they have minimal technological knowledge. Blogs are quick to create and easy to maintain. Through blogging, students can learn about basics of coding, HTML, and how to troubleshoot any problems they have. Blogs do not have any rules. Students can cover whatever they like or feel passionate about. This is a great way to keep them engaged but at the same time put no limitations on them. No one is a born an expert. We need to practice to become good at something. The same applies to blogging, which highly supports writing and argumentation skills. If a student knows the blog is publicly visible to others and everyone has access to it, he or she will focus more on the readability, argumentation, wording and grammar. Many schools and universities use compulsory blogging to strengthen communication and writing skills. Blogs are not only about publishing. There are a lot of different tasks and necessary skills involved in blogging. This is how the world operates today. Job positions are getting more complex; there is a large number of different participants involved and it is important to manage your time properly. This is what blogging helps to teach students if certain requirements are set, such as the number of updates needed per week or month and students giving feedback and comments on each other's drafts. The two most common websites where people can open multiple blogs for free are Blogger and WordPress. In order to get you going even faster, I've written a step by step tutorial on how to launch a FREE blog with WordPress. Here's the guide. 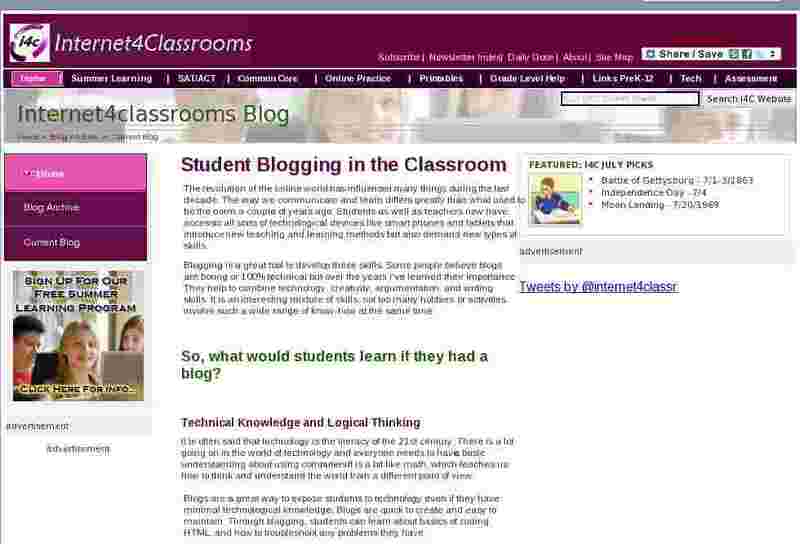 Internet4classrooms has a guide on how to create a blog using Blogger. You can find it here. The blogging world is endless but it can be hard to grasp it without trying it yourself. I suggest every parent and teacher use blogging for their child's development. There are a lot of technical solutions that help to do that easily. I'm opened to discuss the topic further and support.